Tracy Viselli describes ACTion Alexandria -- a new, community-based website that matches potential donors with the needs of local non-profits and other community organizations -- as a technology-aided barn raising. In this NBC4 news report, see how ACTion Alexandria has helped neighbors come to the aid of other neighbors in conjunction with Arlandria service providers. The City of Alexandria is seeking volunteers to participate in the 23rd Annual Potomac Watershed Cleanup and join others across the region to clean up local streams and the Potomac River Watershed. Eaton Square Clubhouse at 801 Four Mile Rd. Trash and litter have many negative impacts on our quality of life. Trash is harmful to wildlife and the environment, and it is an eyesore that impairs the beauty of neighborhoods and decreases property value. Cleaning up and removal of litter also costs local governments funds that could be better used elsewhere. 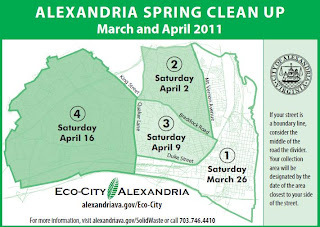 To volunteer at one of the City’s sites, please contact Jesse Maines at jesse.maines@alexandriava.gov. Stream Cleanups. By the time the kids from Earthforce got done their clean-up of Four Mile Run Park last summer as part of their community service project, the results were astounding. In little over an hour, there lay in one big pile, a clump of 30 gallon trash bags, all mostly full. The thing was: it didn't look that bad when they started. Other groups had been through the park all summer and it had never looked better....well, at least not in the last decade. And yet, just a few weeks later, another clean-up organized by Clark Mercer turned up piles of more trash. It's a constant struggle. I asked the Earthforce kids what they thought was needed to keep some folks from having to continuously clean up after other folks. I suggested more trash cans. They suggested more police patrols and security cameras. All I know is that the winter hasn't been kind to the Four Mile Run. Without nice weather to bring volunteers out, the trash and debris is depressingly back. In the long-run, the restoration of the stream will help make the stream clean-up easier, but until then...without some intervening force to keep the litter out of the stream...only Earthforce and their army of helpers can keep the stream alive. Dirty Roads? Meanwhile, the Alexandria Gazette Packet reports (Trashy Citizens) that Councilwoman Del Pepper "has a few words for the Virginia Department of Transportation: Clean up your mess." Ms. Pepper is upset that VDOT, the party responsible for the I-395 is being lax at keeping it clean. "Cigarette butts are everywhere. Empty soda bottles dot the side of the road. Fast food wrappers can be seen here and there....The councilwoman said she heard from one constituent who went out there to do VDOT’s dirty work by picking up trash — 'every dead animal,' said Pepper, praising workers who have begun addressing trash on property they are not responsible for maintaining." Just a question: who's responsible for the parks and streets and streams? There's quite a bit of litter there. Let's find out and get them to help us keep our neighborhood clean, too. Someone should ask. Report a Problem. The City has been quietly rolling out a new issue reporting system on their website: alexandriava.gov. 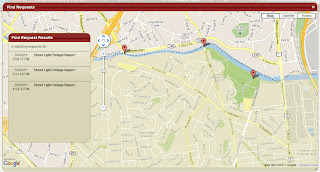 If you go to their main page and click "Report a Problem" on the upper right, you'll find a nifty new GIS-based system that not only allows you to help locate the problem on a map, it also offers you the ability to upload supporting documents or pictures and retains the request for you under you account so you can check back later to see the results. I tried it out last week when I reported some broken street lights and I captured what the screen looks like when you're done. To vote for the indicators in this category, you must register on ACTion Alexandria and then you'll have a total of 10 votes to assign in each indicator category, while assigning those votes to as many or as few indicators in each category as you like. Your votes will be collected and combined with feedback from two Speak Up! Take ACTion! townhall meetings and summarized on ACTion Alexandria by the sponsoring organizations on April 18th. For more information on how the Quality of Life Indicators project, visit Community Health Assessment of MAPP. Go Green Alexandria. Check out the website for the new non-proift: Go Green Alexandria. Their mission is to educate residents about their impact on the environment, to advocate for the conservation of Alexandria's environmental resources and a clean and sustainable community and to encourage green living practices wherever possible. Climate Change. The City of Alexandria's Environmental Policy Commissionand Office of Environmental Quality invite members of the public to attend two upcoming meetings about climate change. Take part in the City's Eco-City Alexandria initiative, learn more about the science of climate change and its impacts on the City, and give feedback on the City’s draft Energy and Climate Change Action Plan. GreenMail. The local Post Office is trying out electric vehicles over the next year. Two different models have been spotted on our neighborhood streets. Carriers say that they mostly work well, but there are some ups and downs. Some of the hills are hard and one of the trucks can only go 25MPH. For those interested in learning more about the project, see www.potomacyardmetro.com. The site will be updated as the project moves along. People can e-mail comments on the project to: comments@potomacyardmetro.com. The deadline to submit comments is Mar. 15. Arlandria in Song. Alexandrian Dave Grohl and his band Foo Fighters have gone from mentioning Arlandria in a song ("Headwires") to writing a song entitled "Arlandria" on their forthcoming album in April (here in this YouTube video is an early performance). 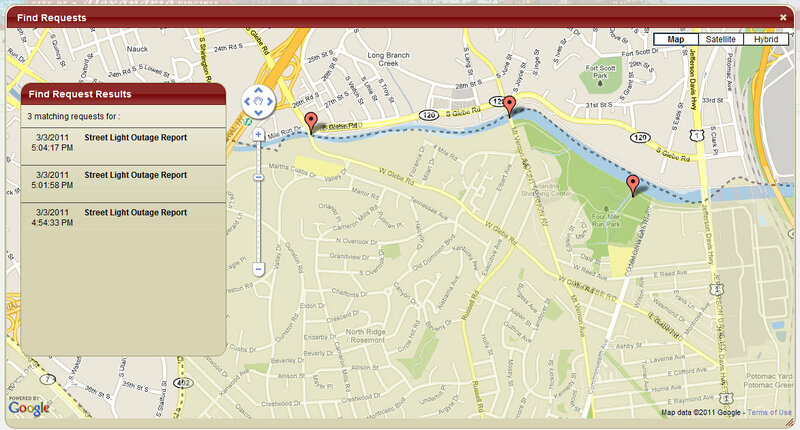 While not entirely sure what Dave is singing about, he seems pretty mad about that litter in Four Mile Run, too. 4MRMarket has been certified to become the first farmers market in Alexandria to accepting SNAP/EBT (food stamps) for qualified purchases. The market has also partnered with INOVA Alexandria Hospital and the Alexandria Health Department to all participants to receive double dollars to spend at the market. This effectively makes the market half as expensive for participants in the program! Produce, seafood, meat, dairy, and breads, and most items for home consumption are the basic eligible items, but you can find a full list by clicking here. The 4MR Community Building (aka the old Duron Paint store) will be renovated for community use by early in the season, providing bathrooms, market storage, and a much better aesthetic to the market! The entire site, from the community building northward to Four Mile Run, will be completely remade into a hardscaped, landscaped, and colorful park, starting this summer! We've been hard at work at 4MRMarket, but not as hard as a group of award-winning, volunteer architects called Architects Anonymous that has helped the community to form and embrace these changes. Please read this article in The Arlandrian to find out more about these changes to the market space. As a convenient bonus, the SNAP/EBT card readers will all for the market to accept Credit Card payments for all vendors, as well. Stay tuned for upcoming dates for a market meeitng. We will also be spending some time at the site doing some prep work and volunteers are welcome to meet us then too. We expect a lot of excitement this year at 4MRMarket: music, events, park improvements and whole lot of good stuff to buy. The intrepid group of area architects has combined forces once more to unleash yet another great set of plans to revive the dormant goal to expand Four Mile Run Park along Mt. Vernon Avenue. You may recall Architects Anonymous from their last Arlandria effort, where they developed a very promising and award winning plan for the parcels of newly acquired open space (4109 Mt. Vernon Ave). 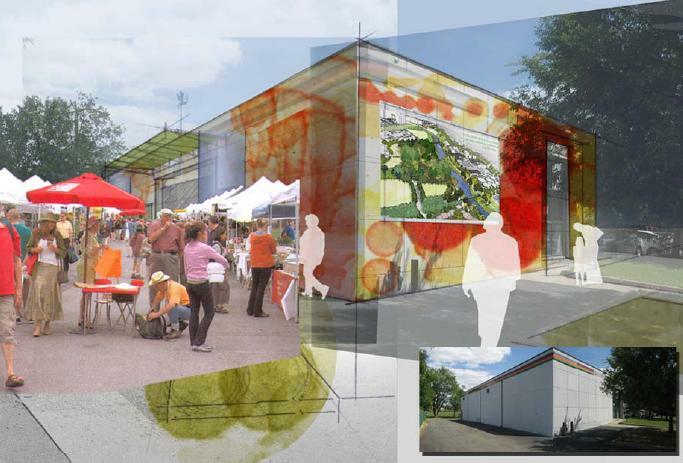 Those became the inspiration first for the Four Mile Run Farmers and Artisans Market, and then for saving the old Duron Paint store building for community use, which is set to begin construction this month. 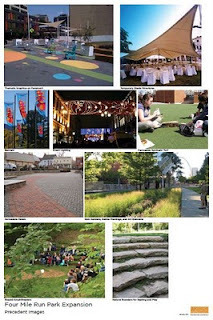 The group continued to refine plans based on community input to create a dynamic outdoor space that acts as a gateway to the City. The architects and City staff have diligently reached out to the community over the months, vetting the plans during a design charrette, then with the Arlandria Plan Implementation Group, the Four Mile Run Restoration Task Force and the City's Parks and Rec Commission. The plans have met with universal support, and feedback has been incorporated into all that's going forward. 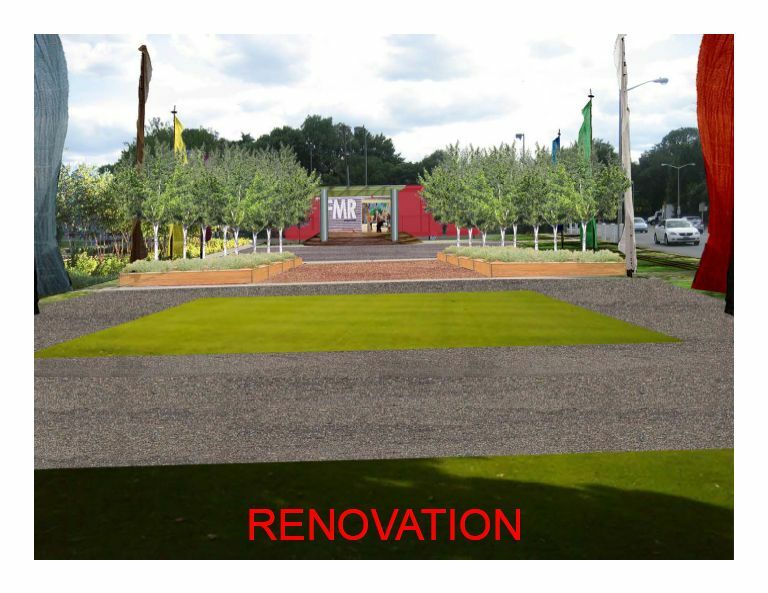 As conceived, the now vacant lots along Mt Vernon Avenue will be transformed into an vibrant community space. 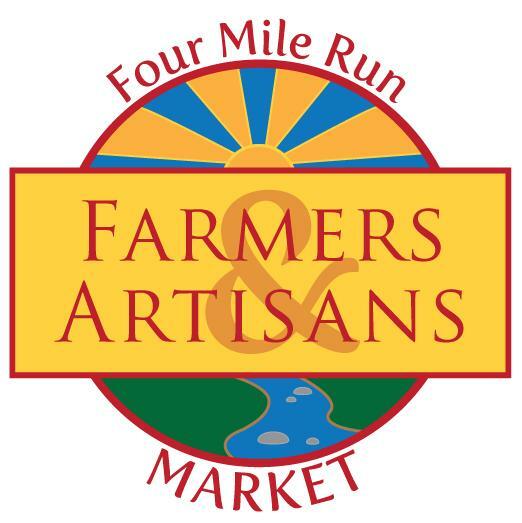 As part of the plan, the Four Mile Run Farmers' Market will continue to occupy approximately the same footprint, with opportunities to expand northward on the site as it grows. The plans incorporate rain gardens, new landscaping, and a number of dynamic elements that can be cheaply and easily altered over time, such as painted pavement and colorful banners. 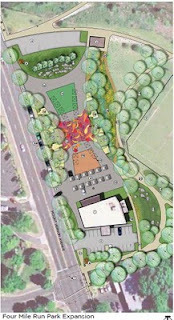 To manage run-off and utilize current site topography, a rain garden would be installed in the low lying area between the pavement and the soccer field. Existing berms can be augmented with rock outcroppings to create viewing areas for soccer games and other community events. Painted pavement will help turn boring asphalt into a colorful and engaging space. Banners will bring color but can also reflect community diversity, events, and define the space. It's an exciting time in Arlandria and around Four Mile Run. There's plenty more news from over the winter about all of the revitalization efforts. Watch this space. The 10th Annual Del Ray Citizens Association Meet-n-Greet will be held the evening of Monday, March 14th, in the cafeteria of the George Washington Middle School. At the Meet-n-Greet, new (and old) neighbors can get acquainted with City agencies and programs, with neighborhood organizations and services and with each other. Everyone will have a chance to find new ways to get more involved in the community, Art on the Avenue and others. Special Time: 7:00 – 9 p.m.
Bring a neighbor, bring your questions, bring your community spirit and please join us! Childcare and light refreshments will be provided! More often seen on the bayou or in the everglades, this air boat was speeding along the Four Mile Run on Monday.